Has your son or daughter (or cousin or neighborâ€™s child) asked you for a Carmelo Anthony jersey yet? My nephew already wants one, and heâ€™s not even a Knicks fan. Before Carmeloâ€™s first game after the crazy deal with Denver, Nets owner Mikhail Prokhorov attempted to steal the Knicksâ€™ thunder by trading for star Utah point guard Deron Williams. It had the effect of a whisper on a subway platform under a bowling alley; Prokhorov couldnâ€™t have distracted from Carmeloâ€™s debut if he had shot somebody. When the Knicks introduced Carmelo that night by showing quotes heâ€™d given about New York (taken slightly out of context, to be honest) on the scoreboardâ€”as if he were Roger Ebert and the city and team were an independent film that needed to be vouched forâ€”the Garden responded like heâ€™d just invented beer. The intensity of the crowd was amazingâ€”and, to anyone whoâ€™s been following the Carmelo saga since before last week, something of a surprise, a reminder of the modern sports fanâ€™s ability to leap from hyperinformed skepticism to totally irrational exuberance. There are many, many reasons to carp about the trade and the Knicks organizationâ€”and most fans had probably digested or articulated all of them, whether on Twitter or by the watercooler, by mid-morning the day after the deal was made. A non-comprehensive list of concerns: team president Donnie Walsh acknowledged that the team gave up more talent for Anthony than they had wanted to. (They may have been suckered into bidding against themselves.) Walsh himself still doesnâ€™t have a contract extension even though his relentless labor is almost solely responsible for accumulating the assets the Knicks needed to think about this deal in the first place. Owner Jim Dolan has a rich history of overruling subordinates to pursue big names at the expense of winning games. Carmeloâ€™s not known as a strong defensive player, and the Knicks are left with only one (relatively short) center on the roster; the team is going to be at best mediocre on D for the foreseeable future. Whatâ€™s more, heâ€™s also in many ways precisely the type of player fans should be scared of: one with well-known weaknesses on the court and a DUI arrest off it, who just did to Denver what LeBron is so despised for doing to Cleveland, a guy who wanted to be a Knick probably half as much as he wanted to lock in a big contract before the NBA and the players union renegotiate their collective-bargaining agreement. Those are all prudent, realistic, logical things to be worried about. 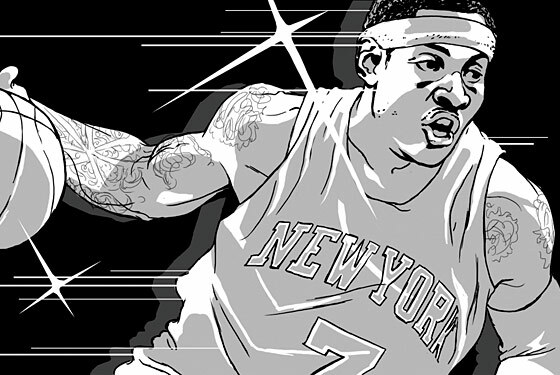 And they have all been wiped away by seeing Carmelo, the unstoppable scorer, take the court in a Knicks uniform. Itâ€™s because part of being a fan, perhaps the central part of being a fan, is letting yourself go. If you canâ€™t table your logic and prudence when 20,000 people are screaming and hopping up and down together, whatâ€™s the point of watching the game to begin with? Itâ€™s inspiring to see: Even after ten years of miserable missteps, from Steve Francis to the Anucha Browne Sanders fiasco, weâ€™re learning that New Yorkersâ€”that allegedly grizzled, cynical groupâ€”can still be, at heart, no less wildly optimistic and unabashedly enthusiastic than your average 6-year-old.